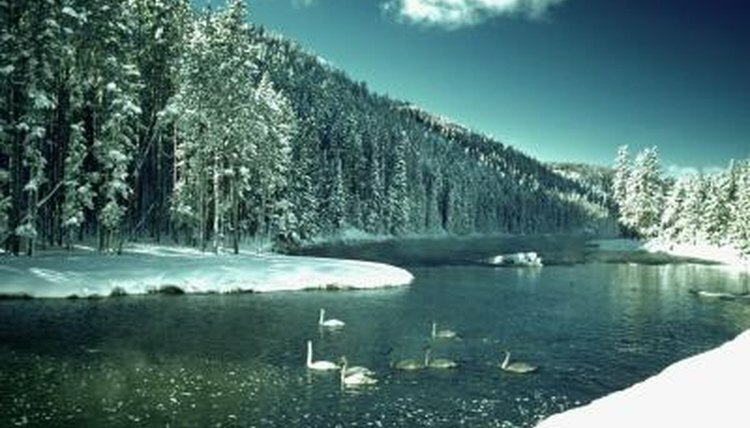 In the late 1800s, Yellowstone National Park became one of the first national parks in the world. It has unspoiled forests, mountains, lakes, waterfalls and rivers. Its active volcano has created more than 300 geysers. The park’s ecosystem has educated researchers for decades, and once critically endangered species are now safely thriving within its borders. With an average weight of 800 pounds and a standing height of 7 feet, grizzly bears rank at the top of the food chain. Only their cubs are vulnerable to natural predators such as wolves. Early European settlers greatly reduced their numbers through hunting and habitat loss. If the female doesn’t find enough food to store adequate fat, her embryos do not develop. In Alaska and Canada larger populations are still hunted as big game trophies. However, in the continental United States, they are a protected species where it is estimated approximately a thousand remain. Nature has a perfect balance that humans often tilt. In the early 1900s gray wolves were eradicated from Yellowstone. Decades later Yellowstone researchers began to wonder why aspen trees and various shrubs were declining throughout the park. Further research showed aspens had stopped producing new trees in the middle of the century. Without their natural predator, the wolf, an overpopulation of elk had upset tree and vegetation growth. Since the gray wolf’s reintroduction to the park in the 1990s, researchers are seeing an increase in birds and other tree dwellers, as well as beavers, fish and insects. Wolverines help keep nature in balance by feeding on birds, rodents and vegetation. They also have been known to kill animals several times their size. Larger populations of wolverines can be found in Alaska and Canada, but it is estimated less than 300 exist within Yellowstone and Washington state. They live in higher elevations because they need stable snow depths of 5 feet or more to create their dens. As the trend in warming climate continues, their habitats are becoming smaller and fragmented. Federal wildlife managers intend to register them as endangered within the contiguous United States. In 1782, the bald eagle was adopted as the national emblem for the United States. However, early settlers consistently reduced the eagle’s population. In the 1940s the Bald and Golden Eagle Protection Act was passed, but with DDT and other pesticides becoming more widely used, eagles faced another threat. Pesticides poisoned animals and plants they consumed and caused their eggshells to become too thin. Government and conservation laws helped improve their numbers, and they now are considered threatened instead of endangered. However, they are closely monitored since their population has replenished slower than expected.